Peugeot again chose the tiny Cotswold village of Southrop and the Thyme estate for the UK launch of the all-new 508, first seen at this year’s Geneva Motor Show, and the Rifter, an up-market version of sister company’s Berlingo. It is an ideal venue, away from public eyes, and just a few yards walk to The Swan, excellent dining and ideal for a group of journalists plenty of whom have known the Peugeot team for many years. A real business and social occasion for an overnight followed by some serious driving. With these press introductions the norm is to pair off the writers, often mates who have done this many times, and then to set off on a predetermined route covering not too many narrow country lanes and some good quality A roads. This area of the Cotswolds is non-motorway country sits in the centre of a M4, M5, M40 triangle but all of them really too distant for a long run on cruise control. If you needed to try your own routing, or got lost, nobody minded with enough cars to keep everyone mobile as long as they wished. 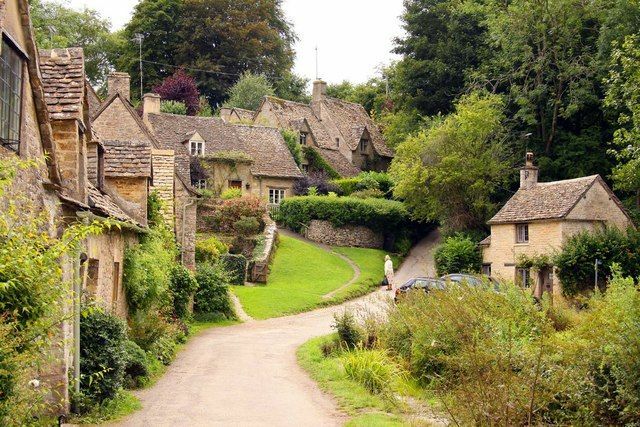 On the set route was the village of Bibury said by the craftsman William Morris "the most beautiful village in England" with its honey-coloured 17th century stone cottages. It certainly was a busy tourist attraction in late September and very much worth a stop. 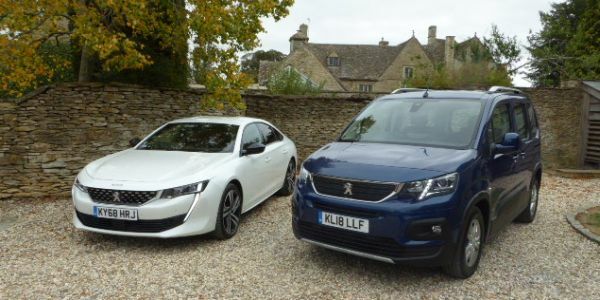 Business Travel News will be reviewing the two new additions to the Peugeot range at a later date in detail, suffice to say the French conglomerate continues to improve the quality of its products and gives way to nobody when it comes to making use of the latest technology. The new distinctive Peugeot front grill was on both cars. Malcolm Ginsberg reports. I am something of a sceptic when it comes to the Peugeot mid-range or D-class cars. Frankly in the past they have been boring, doing their job OK, but hardly setting the world on fire with a cabin no more than adequately holding together some cloth and plastic in a dreary fashion. Driving was just as dull. This new 508, even on a short drive, was a revelation, the radical ‘Fastback’ design looking really smart, its only drawback being reduced headroom for the entry, but that problem being quickly forgotten. And a real pleasure when under way the sample car with plenty of zip and an easy 70mph coming up on any stretch of straight road. With my driving companion taking over at the half way point I was also able to sample the back seat, nicely trimmed and very comfortable. Clearly a car for lesser French civil servants to be driven around in. The old ‘three box’ automobile is really dead and with the new generation of products lifting luggage and shopping into the boot is a forgotten skill coupled to a 487 litre boot. No lip! The 508 is available with a range of six highly efficient petrol and diesel engine / transmission combinations, covering 130 to 225hp and is equipped with the latest generation Peugeot i-Cockpit® technology. The eight-speed fully automatic gearbox on the 1.6 litre 180hp powered car was as smooth as silk. The new flagship model comes with class-leading levels of advanced driver assistance systems, including a new night vision system, which is new to the segment and uses an infrared camera with the ability to detect pedestrians at night and in cases of reduced visibility. A large 10in touchscreen angled towards the driver and a 12.3in head-up digital instrument panel. All the latest ‘toys’ were on board including a ‘lane keeping assistant’, that could be switched off, blind spot detection, reversing camera and park assist. The 508 is assembled at Peugeot Mulhouse close by the border to Switzerland and Germany. UK prices start from £25,000. 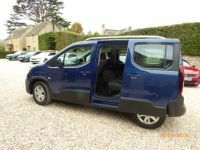 Whatever Peugeot marketing people tell you the brand new Rifter is an ‘up-market’ version of the Citroen Berlingo with all the virtues that the little people mover brings, and all its complications. It is aimed at a very clear sector of motoring buyers and does what it is supposed to do very well. Don’t expect a luxury car for storming down the motorway, it is a smart utility vehicle with sliding passenger doors ideal for the school run, and in its stretched form capable of carry up to seven people in moderate comfort. Two up it bounces about a bit, but loaded the ride is said to be more than adequate. Carrying capacity is up to 4000 litres including an unusual storage facility under the roof at the back. The on board refrigerated space is capable of holding 186 litres items. The rear access panel splits into two. You can just open the window and place items on a shelf and if you do run out of space there also the integrated roof bars. The Rifter comes available with both diesel and petrol engines, a six-speed manual gearbox or an eight-speed automatic gearbox. The Mud & Snow tyre option improves traction control through continuous action on wheel spin. This works in combination with the Hill Assist Descent Control, which automatically maintains optimal speed on steep slopes. Virtually all the accessories available to the 508 are offered on the Rifter as well which shows the sophistication that this family mover has. The touch screen is a little smaller at 8in. Former Berlingo owners swear by them. No banging of doors in the supermarket car park, just a smooth sliding movement as the keyless entry is activated. Air conditioning of course standard plus electric and heated door mirrors. The Rifter comes in Active, Allure and GT Line trim levels with prices starting from £19,650 OTR (on the road) for the short version and £21,570 OTR for the stretched model.